It is located in the middle of Padma street, surrounding by cafes, restaurants, shops. There are convenience store in front and ATM. The hotel formerly named Joni and it has 2 buildings (Joni 1 and Joni 2). They have swimming pool and live band at nite. I stayed in Joni 1 at their deluxe room. I got it through Agoda hotel for USD 38.25/nite include bfast. The room light is not bright but I enjoyed my stay there. Please refer to my post about “Budget Hotel in Bali” for more hotel review and photo. Denpasar Airport to Legian: Rp.35,000 include tips using Bali Taxi (Blue Bird taxi group). 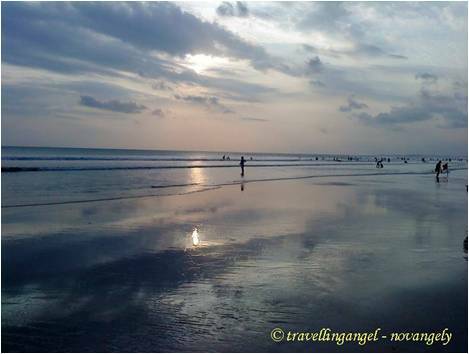 Seminyak to Legian: Rp.15,000 include tips using Bali Taxi. Café Seminyak in front of Bintang Supermarket in Seminyak. Wanted to eat their Giant Burger again but I was full so I had Ratatouille, 2 pcs of my fave strawberry pie and hot tea for Rp.80,000. The taste is so so, their Ratatouille is not well-done, so the veggies was kinda hard to bite, but the strawberry pie is the best!! Buffet lunch at Puri Madha Hotel in Tulamben with BaliScuba group. Taste of satay, veggies is spicy but not bad. Mozzarella Restaurant in Jl Padma Legian. I love this resto!! I had my late lunch/early dinner there. The staffs are very friendly. The Carbonara spaghetti is so delicious. Love their Pina Colada cocktail also. They have promo buy 1 get 1 free cocktail. The place is also so nice that I really enjoyed my afternoon there sitting in the sofa and eating while listening to the jazz techno music. I spent about Rp.150,000 for this. Thai Massage at Mirah Spa & Salon in Jl Padma Legian, it is about Rp.120,000 for 2 hours. I think you could get other place for better massage. Internet café in Seminyak, costs about Rp.14,000/hour. It’s so damn expensive but the connection is the fastest I found in Bali so far so no complaint. Small tattoo at Ibud Tattoo shop in Padma Utara street costs about Rp.500k . 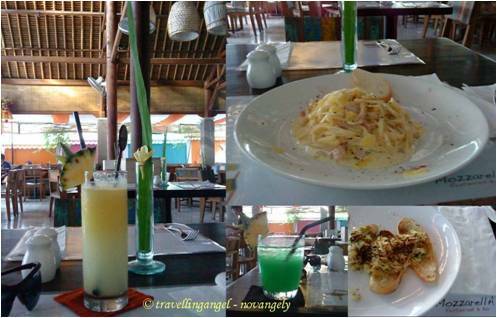 I heard they are one of the best in Bali and the result is .. I am very satisfied with it!! As usual, I always walk to exit gate of Denpasar airport to catch the Bali Taxi (blue bird group) cause their price is more reasonable than airport taxi. This taxi is also most trustable, especially in Jakarta. It took about 20min to reach my hotel, Legian Village Hotel. The hotel staffs greeted me and gave me a welcome drink of delicious Margarita ^^ Love it!! A staff took me to my room. I actually requested to have a double bed room at Joni 2 which I heard newer but instead I got twin bed room in Joni 1. I was so tired so no need to argue. They were very welcome to me anyway. After unpacking my luggage and packing my dive equipment for the next day trip, I went to Bintang Supermarket in Seminyak to buy the daily needs, snack and drinks. It took about 20min walk, quite far, but their price is much cheaper than convenience store. 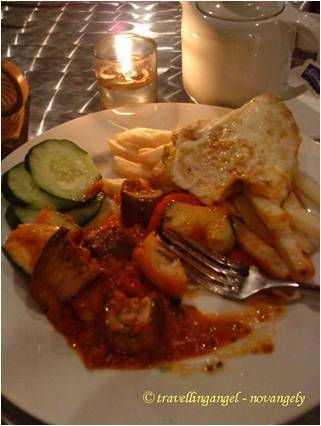 Anyway, I wanted to have my supper in Café Seminyak, in front of it. I wanted to eat their Giant Burger again but I was full so I had Ratatouille, 2 pcs of my fave strawberry pie and hot tea for Rp.80,000. The taste is so so, their Ratatouille is not well-done, so the veggies was kinda hard to bite, but the strawberry pie is the best!! Then on the way back to the hotel, I found an internet café nearby and tried it. Their connection is so fast but it is expensive 😀 after an hour there, I went back to hotel, wanting to walk but unluckily it was raining. So I took a Bali Taxi, cost me only Rp.15,000 include tip. There was a live music playing downstairs but I manage to have a good sleep, a short one. We arrived in Tulamben around 11:30am, I ordered sweat tea directly to counter a bad stomachache on first dive cause of late lunch. Then we set up our gear, put suncream on hair and face (girl habit LoL). It was the first trial for my new dive gear (wetsuit, pointer, headband, mask) and happy to know that most of it worked well. My wetsuit fits me. My mask is fine, my snorkel was not used but it worked when I tried it on pool. The pointer is really useful down there to call your DM or group or when u dive into the tunnel.. One gear is not working properly though. I have long hair so I used a hair&ear cover band I bought from Nemo Wetsuit shop. But this band turned out making the water entering my mask. I wont to use it again. Anyway, soon later the first dive started. We have our dive from Puri Madha Hotel frontbeach. There are 4 divers in my group include DM and all hot ladies ^^ . It’s my first shore entry dive after getting my OW license. The wave that time kinda made it a difficult entry for me. I still needed the help of my DM to put my fins (she called me a baby hihihi..) My descending and buoyancy also still need more experience. I managed to get down anyway and started enjoying the beautiful Tulamben underwater. We dived near the wreck to 18m below and saw the school Jack Fish ofcourse. It’s very famous in this site. The we saw nudibranch and the coral .. sorry I cannot mention all I saw because mostly I don’t know its name LoL (newbie)!! Ow- on our safety stop, we were accompanied by an interesting group for surgeon fishes. They are very friendly to us :D.
Then we had an hour surface interval before next dive, in which this meant having Lunch!! YEAH!!! It’s buffet lunch with option of Indonesian food, mixed veggies, satay, fried tempe and tahu, fish, French fries. The veggies and fish are too spicy so I ended up eating French fries with satay and rice. Weird combination. An hour later, the second dive started. This time I could put the fin by myself. YES!! The descending still needed more training though but my buoyancy was getting better. This second dive, my mask was filled in by water many times cause of my hair band. So my concentration is mostly on mask clearing, very annoying. Anyway, I saw nudibranch again, eel garden and fishes and corals and met that group of surgeon fish again during our safety stop. I wonder why they are always there. Well, the dive took 40min and it felt so fast.. I wish I could have more dives. The journey back to Sanur and back to hotel seemed so long. 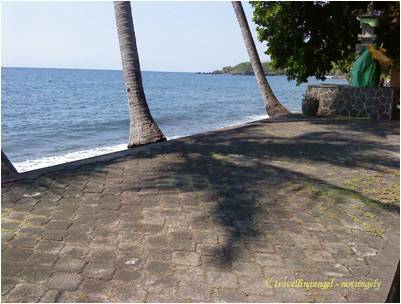 We left Tulamben around 3:30pm and I reached my hotel around 7pm. And I still had to clean up my gear, then dress up for dinner and enjoying the Saturday nite. It was a long and fun day! I woke up at lunch time hahaha… very late start for Sunday during holiday. After 100% woke up, I went for a massage near the hotel called Mirah Spa. I thought this was the same branch as the Mirah Spa in Denpasar, which is a good Thai Massage place. The sales guy said it was the same but I was fooled. It was far away from the massage in Mirah Spa. So stupid me!! Mozzarella Restaurant in Legian. Love it! Then I went to find Mozzarella Restaurant. I read good review from TripAdvisor.com about this place which is near my hotel. So I tried to have my late brunch or lets say my early dinner there and it was the highlight of the day!! The food, price, service, the place were so delicious, affordable, friendly and nice!! Highly recommended!! That kind of food might cost double in Jakarta 😀 Thanks God I read that review but unfortunately I didn’t want to miss the sunset so couldn’t enjoy the place longer. On the way to the beach, I checked out the Tattoo Shop called Ibud Tattoo. It’s located next to Ramada Hotel in Jl. Padma. Apparently you need to make an appointment with them first. Lucky the guy there is so nice to arrange me the time at nite that day. So while waiting, I went to Kuta Square by walking along the Legian Beach and Kuta Beach, watching the sunset, seeing the people playing soccer or playing in the water or surfing.. It was a lovely day. I managed to get to Matahari Kuta Square in 30min walk then shopping around and back to the tattoo shop. I wanted to have my own design, combining from 2 pictures and they made it as requested. The result is also as expected. It was my first and my last tattoo I guess. Apparently having a tattoo is not that hurt, more like tickling. Well, I got all I want. Next I met my friends and enjoyed the rest of the nite. Today I finally managed to have breakfast at the hotel. They have selection of breakfast menu and drink option in the buffet table. I had toast with butter and jam and there were omelet and fruit and juice and hot tea. Food taste is so so. I hardly enjoy it also cause I had to catch my 10:00 am flight back to Jakarta and straight to office. I was so sleepy, tried to sleep in the plane but the man next to me was so talkative. I managed to sleep anyway in the plane and in the office LoL!! What a day!!! Note: I think I prefer staying in Legian area than my fave Poppies Lane 2 area now LoL!! The people and tourists are nicer in here.